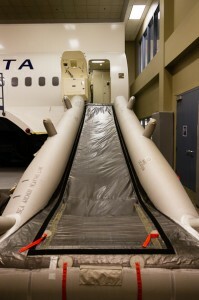 As part of the “Grand Re-Opening” of the Delta Flight Museum, NYCAviation was among a select group invited by Delta Air Lines to take an inside tour of the facilities and operations in their home city of Atlanta. Being a resident of the ATL myself, I was dispatched to attend the festivities to get a firsthand look at what it is to be Delta. After receiving the itinerary for the museum ceremony I noted that the entire “Inside Delta” event was spread over three days, coming to the realization that this would probably be above and beyond your typical three hour tour, Gilligan. “Check in”? I thought. They must mean “let the Delta point of contact know you’re here”. But as I found out when I arrived, that actually meant “check into my room at the Renaissance Concourse Atlanta Airport Hotel, with an airport view of course, and then join us for the buffet with open bar.” Awesome possum. The morning briefing at the OCC. 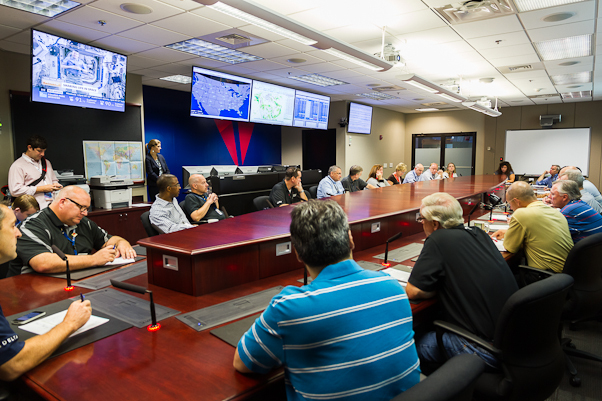 First it was off for a visit to the Delta Operations and Customer Center (OCC), guided by Senior Vice President Dave Holtz. We arrived in the middle of the morning briefing, which looked like a scene out of the White House, and then were brought into the actual OCC, which looked like a scene out of NASA. 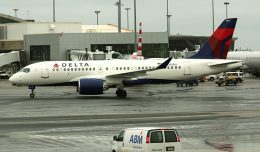 This is the place most passengers don’t even know about but probably has the biggest impact on their travel plans, and with that thought in mind, our tour guide discussed Delta’s innovative new denied boarding compensation model. The new procedure permits airport agents to use Amazon.com gift cards and other creative techniques besides the usual flight vouchers to try and lure people off oversold flights. It’s in the test phase now, but the results look promising, so you may find the airline’s reps dealing out iTunes credits while they rebook you on the next available flight! 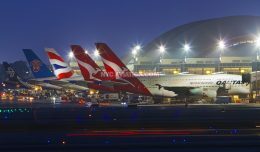 From there, we hopped on the bus, Gus, to ATL Tower A, where some very skilled people play with the planes of the biggest carrier at the world’s busiest airport, slotting them into gates for maximum convenience to passengers. I’m sure the passengers appreciate all their efforts 100% of the time! 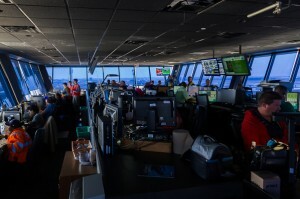 The personnel in Tower A coordinate aircraft gate assignments. 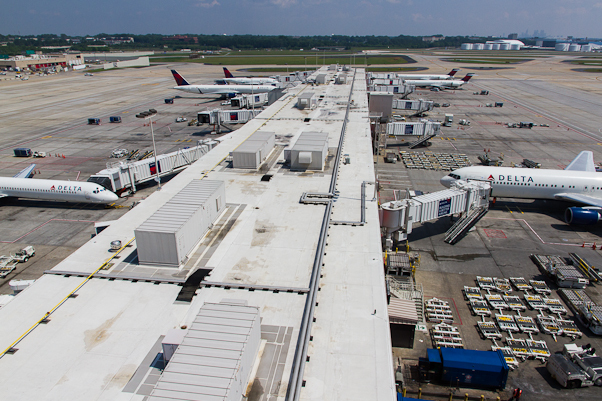 After having to damn near pry me from that awesome photography spot, we traveled through the very heart of ATL to the Concourse B baggage facility which processes a whopping 40,000 of the 130,000 bags Delta transports per day. It’s really a fascinating area with miles of belts that our Delta tour guide would not let me ride no matter how nicely I asked. Also rejected: My brilliant idea to renovate the airport with glass bottom floors so passengers can follow their bags through the complicated process of delivery to their plane. Following that the tour made a big change of pace as we departed the bowels of Atlanta Hartsfield-Jackson International Airport for one of the more cleaner, quieter areas: The brand new International Concourse F Delta Sky Club for lunch. 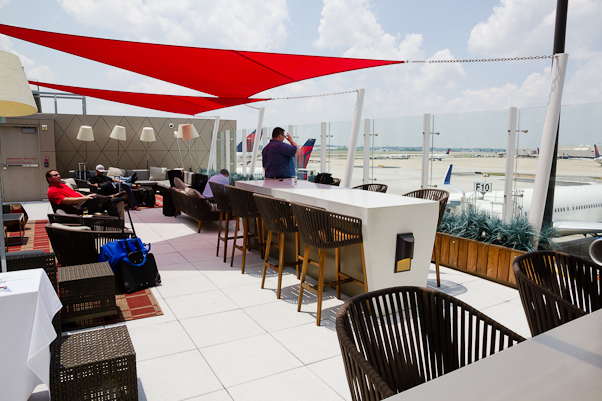 This particular Sky Club features an outdoor roof top observation area, an item that did not get past someone who has drank his fair share of beer while spotting planes (me). The outdoor deck of the Delta SkyClub allows for prime aircraft viewing while sipping an adult beverage. On the way to a tour of Delta Technical Operations (TechOps), we stopped off to take in an example of one of Delta’s widebody fleet. Since the daily Atlanta – Tokyo 747 flight had already departed, we were led onto the next biggest piece of ‘widget equipment’, the A330-300. This particular plane would be leaving for Milan in just enough time for us to sample Delta’s premium product: Business Elite. Prior to this tour, I had just experienced a series of long haul flights on Qatar Airways, the self-proclaimed “world’s only five star airline”,and perhaps I had high expectations, but the take away I had from that trip was “You know, they’re not really any better than what I’ve seen on Delta”. First Class aside, the Business Class products were strikingly similar. In Economy, Qatar and Delta were practically on par with each other with only slight differences here and there. 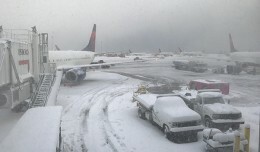 That’s not a knock on Qatar but a compliment to Delta. More nuts and bolts as next up was the enormous Delta TechOps; the maintenance, repair and overhaul facility. It’s spacious! A whopping 63 acres across the east side of ATL to accommodate heavy maintenance and pretty much every aircraft in the DAL fleet as well as the various airlines that outsource their work to this industry leading department. It just so happens we arrived just in time to witness an engine run up followed by a tour of a five day old 737-900 going though the major surgery of having its Gogo in-flight internet installed. A 737 in the midst of having Gogo inflight wifi installed. And on that Gogo in-flight internetyou can troll on the Facebooks, the Instagrams, and the Tweets. Or, if you’re one of those crazy people that actually like to use the interwebs for productive means, you can contact Delta on social media and it will be answered by any of the fine people manning their ‘Social Media Lab’. 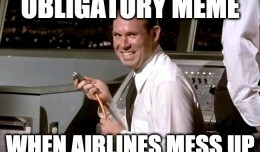 The Lab team monitors for current passengers who need assistance, future passengers who have questions, and properly respond to current events in the world of Delta. …Kidding of course. This was one of the highlights naturally. Video of the Q&A video can be seen below and without being redundant, Mr. Anderson gave us an hour plus of his time on a wide range of subjects from a recollection of his very first flight to what Delta’s plans are for their ambitious Seattle hub. It’s easy to figure out why Delta’s is an industry leader and is profitable in a difficult industry when listening to his in-depth knowledge of an array of subjects. His technical savvy combined with Southern charm is clearly reflected in the Delta product. 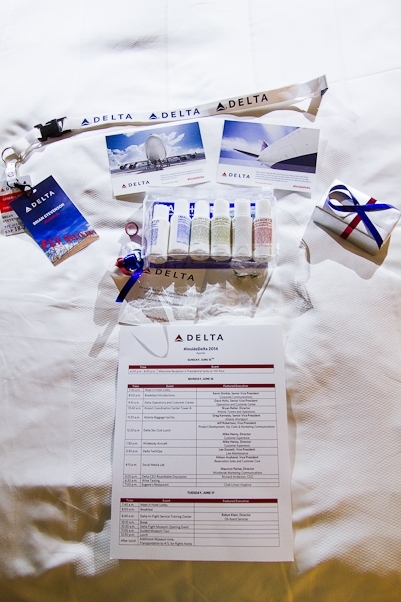 That did it for the day’s activities, but the night was young and Delta treated us to a fine dinner at Restaurant Eugene in downtown Atlanta, who supply some of the meals for Business Elite on flights departing ATL, complete with a pre meal wine tasting. Did I feel out of my league? Absolutely. Was I going to pass this up? Absolutely not! A mock cabin and evacuation slide for safety training at Delta’s In-Flight Service Training Center. 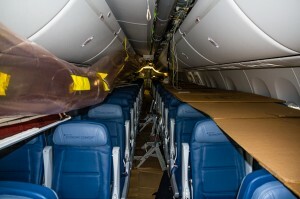 Ever evacuate a 757 at 9 o’clock in the morning? That was on tap for our first activity of the day, a guided tour of what your flight attendants are primarily there for:your safety. Having been a flight attendant in a ‘past life’, this sparked as many good memories for me as I’m sure it opened the eyes of some of the others in our group. And then, of course the Delta Flight Museum Grand Re-Opening was next. All in all, an impressive weekend where I can safely draw a final conclusion: When it comes to aviatin’, Delta is doing it right! Additional photos can be viewed below. All photos and video are courtesy of the author. 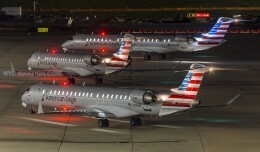 Brian Stevenson is an Atlanta-based airline enthusiast and aviation photographer. His work can be seen on Facebook.